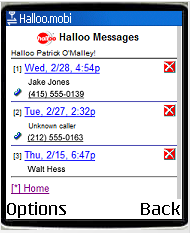 Access and manage your Halloo voicemail with the halloo.mobi Mobile Visual Voicemail feature. Sign in to halloo.mobi and click on the Voicemail link, or press  on your keypad. Please see the Support article Go Mobile if you do not know how to sign in to halloo.mobi. Your messages will be displayed in reverse order according to their time stamps. Using your navigation keys, click the Time stamp of the message you wish to hear. The message will be downloaded and played on your phone. Each message also has a shortcut number set off in brackets, for example  will play the first message on the current page. Up to 10 messages will be shown per page, and they will be numbered from 1–0. Each voice message has an embedded link to the phone number of the person who left the message. Using the arrow buttons on your keypad, navigate to this link to call the person back. The call will be placed directly from your mobile phone, and will not be routed through Halloo. Navigate to the [X] icon next to message you want to delete. Click and confirm to remove the message permanently from your Halloo inbox.